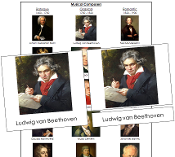 These cards are formatted in a 3-part card series and include 24 Musical Composers: Bach, Corelli, Handel, Monteverdi, Purcell, Vivaldi, Beethoven, Hayden, Mozart, Clementi, Salieri, Gluck, Mendelssohn, Schumann, Chopin, Brahms, Tchaikovsky, Strauss, Prokofiev, Stravinsky, Bernstein, Copeland, Gershwin, and Ives. Cards with label are approx. 3¾" x 4", cards without label are approx. ¾" shorter. Control Chart is approx. 8"x10".